Hotel Ummed Jodhpur, Ummed Hotel Jodhpur, Reservation for Hotel Ummed, Jodhpur, India. 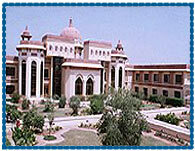 Address: Banar Road, Jodhpur-Jaipur Highway Jodhpur, Rajasthan, India. Hotel Ummed is located in the jodhpur, spread across 40-acres of landscaped gardens, perfect exemple of Jodhpur-style havelis. Hotel has a distinctive low-rise building built around a spacious central courtyard. Hotel offers a perfect setting to experience the rich culture and traditions of Rajasthan with uncompromising space and comforts. 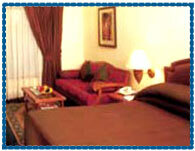 Hotel offers 88 rooms and suites, built round a courtyard intricating a blend of contemporary and traditional styles. Business Center, Computer, Fax Service, Internet Facilities, Meeting Facilities, Photocopy Service, Printer, Air Conditioned Room, Air Cooled Rooms , Airport Transfers, Baby Care, Barber / Beauty Services, Cable TV, Car Parking, Children Welcome, Doctor On Call, Fan, Fire Safeguards, Free Newspaper, Health Club, Laundry Facilities, Lift Available, Money Changer, Non Smoking Rooms, Parking, Partially A/C, Power Back-Up, Room Service - 24-Hour, Safe Deposit, Shopping Arcade, Station Transfers, Travel Desk, Playground.